This bracelet is the first finished item in my Heart Clasp Series. 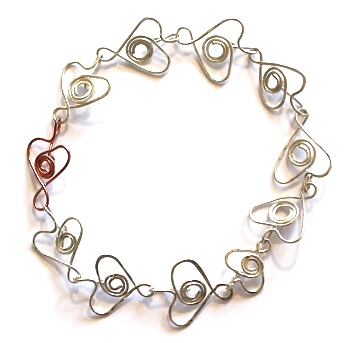 - By adding a loop at the bottom of each heart they no longer slid around. - Each link in the bracelet is now a clasp so you never have to search for the right one. - The design of how they function as a clasp has changed and is now all hidden at the back of the heart shape. You can see how else I used the clasp in the other items in the series.